Adds a fully-automatic .45 Auto Pistol to the game. Requires Honest Hearts DLC. Fitz's .45 Machine Pistol patch for Asurah's Reanimation Pack This is the weapon pack from which you get the gun. 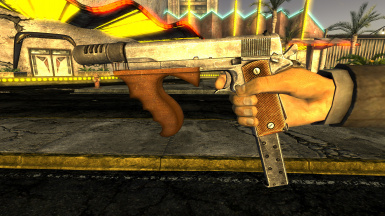 The vertical grip mesh and texture were taken from the 'CFA - Classic Tommy Gun' mod (https://www.nexusmods.com/newvegas/mods/61800), with permission from its creator, Listenerr. Thanks for letting me use it! 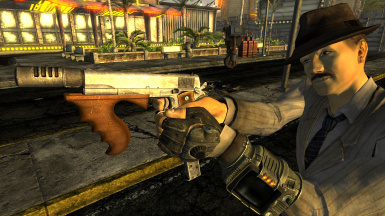 This mod adds a fully-automatic .45 Auto Pistol to the game. Functionally, it can be viewed as a counterpart to my Schnellfeuer mod, but intended for red-blooded patriots who would rather die than sully their hands by using filthy Communist weapons. Visually, it is inspired by gun modifications from the 1920s and 30s. The base gun has been given the Fitz Special treatment (bobbed hammer spur and cutaway trigger guard to reduce snags and aid in trigger acquisition), while the fully automatic conversion, Cutts compensator and Thompson gun foregrip are the hallmarks of Hyman S. Lebman, who converted pistols this way for famous Depression-era gangsters such as John Dillinger and Baby Face Nelson. 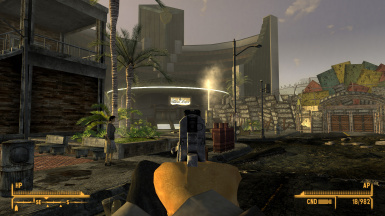 The weapon has three mods available - a compensator, a forward grip, and extended magazines. Both the compensator and forward grip reduce the weapon's considerable spread, while the extended magazine more than doubles ammunition capacity (bringing it up to 18 rounds). I've added the weapon to all the appropriate form lists so that it counts for all the applicable perks and challenges (Except for 'Way of the Caananite', which would have required me to edit the perk directly, and that could have caused compatibility issues with other mods so I left it alone). It is also considered an improved holdout weapon, so you can sneak it into casinos with a high enough Sneak skill. All the meshes, with the exception of the forward grip, were made from game assets included in the Honest Hearts DLC. 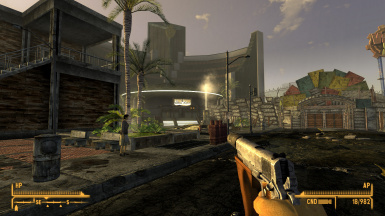 The base gun is the .45 Auto Pistol and the compensator comes from the .45 Auto Submachine Gun. The forward grip mesh and texture come from Listenerr's CFA - Classic Tommy Gun mod and is used with permission. The weapon can be looted from the body of Jerome Berringer - notorious bootlegger, outlaw and all-around ruffian. 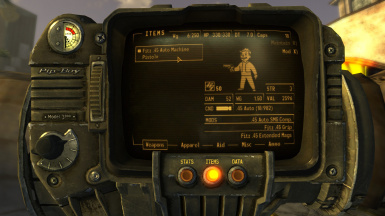 He can be found in the abandoned Mojave home, north of the mole rat ranch and west of Fields' shack. A few other talented individuals have made alternate plugins for this mod, allowing it to be used with various other community resources. 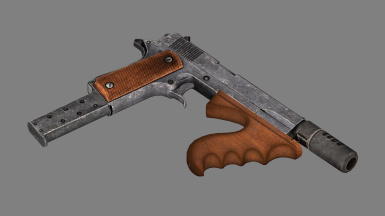 I'm fully aware that the 1911 is a single-action platform and that bobbing the hammer spur will impede its function. However, instead of just declaring Rule of Cool right off the bat, I'd like to offer a justification first as to how it could be a workable (although certainly not ideal) modification to make. First, you could always carry cocked and locked - just use the slide to chamber a round as soon as you load a magazine and then flick on the safety. Alternatively, you could carry with an empty chamber and do an Israeli draw, racking the slide each time you unholster. I know this would be slower and less practical, but this gun was not designed to be an uber-tactical weapon using modern manual of arms. It's supposed to be a throwback to the 1920s and 30s, where they would do all sorts of weird (and to our eyes, flat-out dangerous) stuff in the pursuit of modernity. Besides, it's only a game. Enjoy it!